Sagebrush shelter Based on archaeological evidence and theoretical intepretations, this display at the Museum of the Mountain Man is what archaeologists believe a typical camp might have looked like 6,000 years ago in the Sand Draw area south of Pinedale. Mark Miller-John Laughlin Mark Miller - Wyoming State Archaeologist (L) and John Laughlin - Wyoming State Historic Preservation Office (R), spoke at the presentation. Large crowd Over 110 people attended the program. Even after bringing out extra chairs and benches, there weren't enough seats for everyone attending and some people stood through the program. This was a verification of the Museum's expressed desire to build an addition that includes a new meeting room for their special programs. You're Official! Carolyn Buff, Secretary/Treasurer of the state WAS, presents Sublette County WAS chapter President Sam Drucker with the new organization's signed charter papers. Emily Kelley (far left), Senior Communications Specialist with Questar, looks on and claps. 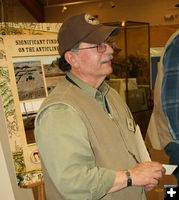 Bill Current Bill Current is an archaeologist and owns Current Archaeological Research Inc, based out of Rock Springs. His firm has done many excavations projects in the Upper Green River Valley. WAS Sign-up Betty Gifford (L) is the new WAS Sublette County Chapter Secretary and Les Margo (R) is the new Treasurer. 53 people signed up as new members as of Wednesday night. Shell, Ultra and Questar natural gas exploration companies, operators in the Pinedale Anticline natural gas fields south of Pinedale, hosted a special presentation at the Museum of the Mountain Man on Wednesday about archaeology on the Pinedale Anticline. Over 110 people attended the presentation, a standing-room-only crowd which caused the Museum to have to search for chairs to try and seat everyone who came. The great turn out for the topic of local archaeology was a surprise and cause for delight for the organizers of the new Sublette County Chapter of the Wyoming Archaeological Society which co-hosted the event. The Sublette WAS is sponsored by the Sublette County Historical Society and had their inaugural meeting as part of the archaeological presentation Wednesday night. Special speakers were John Laughlin from the Wyoming State Historic Preservation Office (SHPO), Rob Schweitzer from the Pinedale Bureau of Land Management office (BLM), Bill Current of Current Archaeological Research, Mark Miller-Wyoming State Archaeologist, Clint Gilchrist of the Sublette County Historical Society, Carolyn Buff from the state Wyoming Archaeological society office, and Sam Drucker-Pinedale Bureau of Land Management Archaeologist and new president of the Sublette County Chapter of the Wyoming Archaeological Society. Since the beginning of the oil and gas boom in the Jonah Field and Pinedale Anticline in the early 1990s, thousands of new archaeological sites have been identified in Sublette County. Because the activity is occurring on federal land, federal laws protect and dictate what must be done to protect any cultural sites discovered during management activity on the land. John Laughlin, from the Wyoming State Historic Preservation Office, went through the various federal laws that protect cultural resources. If the cultural resource cannot be left alone or avoided, land managers must find ways to deal with protecting and preserving them, he said. Rob Schweitzer, archaeologist with the Pinedale Field Office of the Bureau of Land Management, talked about artifact collecting laws. He said, "Unlike natural resources, cultural resources are a non-renewable resource." He commented that other states are experiencing more looting and destruction of their cultural resources than Wyoming is. "In Wyoming, there hasn�t been a lot of criminal activity," he said. According to Bill Current, who owns Current Archaeology out of Rock Springs, the Pinedale Anticline is significant for the number of dwelling sites uncovered there in clustered locations. Physical remains discovered include excavated dwelling features in the ground, artifacts, plant and animal remains, and even human remains. Current theorized these ancient groups of people fluctuated between Sand Draw and the New Fork River living and looking for food. "Despite your opinions about oil and gas, they�ve done a great thing for archaeology," Current said. He presented graphs showing the rapid increase in the number of discovered archaeological sites associated with natural gas exploration activity. Since 1994, documented sites increased from 1,700 to almost 7,000 sites. "Between 3,000 to 8,000 years ago, this area was heavily utilized," Current said about the Upper Green River Valley. Archaeologists have found a number of sites indicating the presence of brush structures dating from 3,370 to 8,210 years ago. "Archaeologically, these house sites are very important," Current said. They are significant for the number of dwelling sites they contain and their close proximity to each other. The clustered dwellings appear to have been used multiple times over several thousands of years. Archaeological evidence has turned up a diet primarily of rabbit for meat and seeds which were ground and baked. He said the northern Anticline has evidence of clustered housing and a diet indicating seed processing and antelope for food. "We�ve found a lot of seeds and grinding stones (metates) used in fall collecting," Current said. The J.D. Love site in the southern end of the Pinedale Anticline produced the oldest known burial in the state of Wyoming, dated to about 7,000 years ago. This was a woman in her 60s with very worn molars and who suffered from osteoporosis. 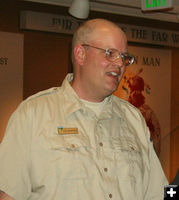 Mark Miller, from the Wyoming State Archaeologist�s office, talked about the management of found artifacts. "The artifacts are the property of the surface owner," he said. On federal and state lands, artifacts eventually are placed in designated archaeological repositories. For Wyoming, the University of Wyoming has an authorized long-term storage repository for federal artifacts, with some collections housed there now more than a century old. A new anthropology building was built at UW in the past two years which has a state-of-the-art repository up to federal code. The University can do loan agreements with museums and institutions, such as the Museum of the Mountain Man, to allow them to display some of these artifacts, if they can provide for their proper security. Sublette County Historical Society (SCHS) Board member Clint Gilchrist spoke about the vision of the SCHS board, which is the parent organization of the Museum of the Mountain Man. He said they envision doing an expansion to the Museum sometime in the future. 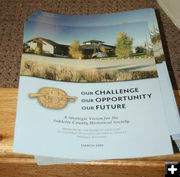 The SCHS revealed their Master Plan in 2009, which includes a new archaeology wing to the museum complex in Pinedale. He said in his view it is no persons job to actively take the broader view to correlate the tremendous amount of archaeological data being uncovered in the Upper Green River Valley to interpret the whole picture. Gilchrist said the Pinedale area is currently in a natural gas development economic boom. Before that, we had a ranching-settlement era economic boom based on cattle, and before that the valley had a mountain man fur trade era economic boom based on beaver. In his opinion, the archaeological evidence shows that thousands of years ago we had "The Archaic Boom" in this valley, but we don�t know why it occurred. "We want to find out what was happening in that archaic boom," he said. The Museum wants to have a place to display that archaeological information and to be the ones to tell the story of what was happening here then. At the end of the presentations, Carolyn Buff talked about the Wyoming Archaeological Society (WAS) and what it does. She presented Sam Drucker with the papers for the official signed charter for the new Sublette County Chapter of the WAS. She was delighted to have a new chapter forming in Sublette County and told the enthusiastic audience that the WAS offers interesting field trips and learning opportunities. "It is a chance to make dear friends for life," she said. Drucker said the Chapter will need to have another meeting where the membership votes on their official name and votes the interim officers officially into office. WAS t-shirts, hats, stickers and magnets are available to order. This year�s t-shirts have a design of petroglyphs from LaBarge bluffs. Anyone interested in joining the new Sublette County chapter of the Wyoming Archaeology Society can find more information at their website: www.sublette.com/was. The Archaeology on the Anticline meeting was catered by Moose Creek Catering in Pinedale. Sam Drucker Sam Drucker, archaeologist with the Pinedale BLM office, is the new president of the Sublette County WAS chapter. Rob Schweitzer Pinedale BLM archaeologist Rob Schweitzer. 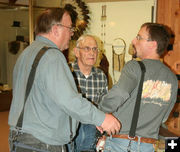 Talking history Mark Miller (L) and John Laughlin (R) talk with local rancher Paul Hagenstein (M). 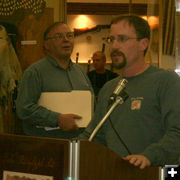 Paul was one of the founders of the Museum of the Mountain Man. Sagebrush hut This view shows the back side of the structure. A portion of the sagebrush has been removed to allow view of the details inside. This construct is a best guess based on evidence found at the archaeological excavation site. This exhibit was put together by Gary Holman, a retired exhibit designer who lives in Lander. Vision Document The Sublette County Historical Society hopes to someday build a new archaeology wing addign to the museum complex. A printable version of the Vision document can be found in the Related Links above. 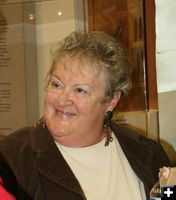 Carolyn Buff Secretary/Treasurer of the Wyoming state WAS.